When you think of airport hotels, no doubt you picture stark white walls, bland, inoffensive curtains and a regretful room service order. It’s not your fault, it’s just that no one expects much more from a hotel you’re staying in purely due to circumstance – be it lost luggage, or a cancelled flight. 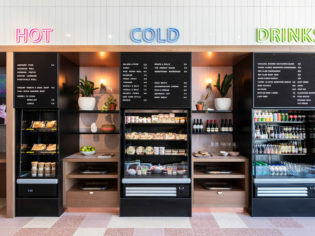 However, boutique hotel group 8Hotels (whose portfolio includes Sydney’s astrology hotel, Ultimo) has set out to turn the airport hotel industry on its head and has made headlines due to the out-of-the-box planning that went into its new Mascot offering, right next to Sydney airport – Felix Hotel. I bet you’ve never seen this before. When you enter Felix, you’re met with… well, sort of nothing. Nothing but a nod from a lone concierge who invites you to make your way up to the Penthouse to check in. A concept so foreign it makes you wonder if you’ve just fallen down the rabbit hole – and you’d be forgiven for thinking you had. The lift is a welcome experience, which at the time I visited was celebrating 40 years of Mardi Gras messages by way of neon lights. It was a 30-second party I enjoyed all the way to the top floor. Once out of the lift, the room’s vibrancy hits you all at once: self-serve check-in booths, friendly faces behind the desk, an eclectic colour palette and furniture that wows all the senses at once. One minute in and I’m feeling more like Alice than ever. Further from the lobby, still on the Penthouse floor, is a sort of outside mezzanine that plays home to the rooftop cinema. Complete with fireplace, the balcony – which is accessed through sliding doors – is a cosy spot to snuggle up and watch a movie in the winter, and open and breezy in the summertime. The kid-friendly flick kicks off at 6.30pm and the grown-up movie around two hours later. Opposite the cinema is where you’ll find the 24-hour eatery. 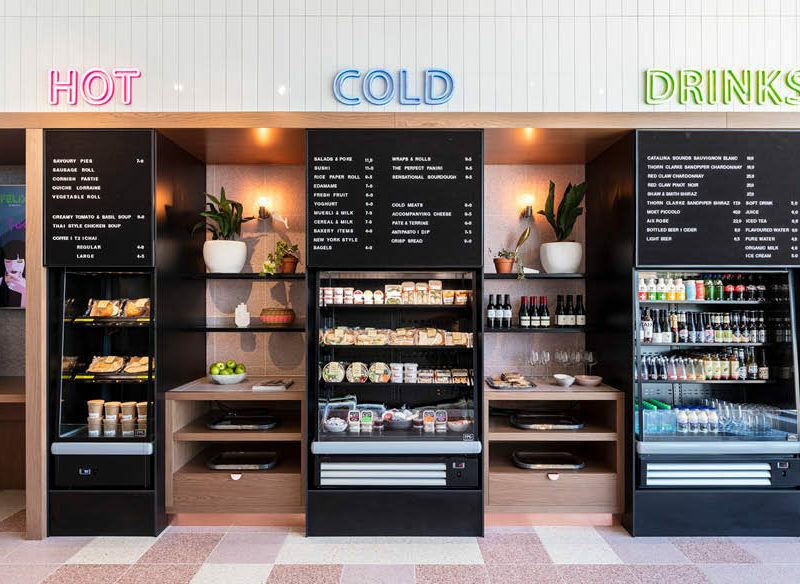 Catering to the short-stay clientele, the eatery is set up to grab-and-go, choosing from freshly-made dishes like chicken poke bowls, flaky beef and red wine pies and pulled pork baguettes – no wait time necessary. There are also cheese and charcuterie boards to gorge on, as well as fresh sushi and rice paper rolls for the health conscious. You can choose to chill in the swinging chairs or lounges in the Penthouse, or take your food and drink – either expertly poured or taken from the fridge yourself – down to your room. By the time the sun rises, most of the meal options have swapped over to be breakfast appropriate. Think bacon and egg rolls with tomato relish, ham and cheese croissants and fresh bagels with cream cheese. Oh, and there’s no instant coffee in sight – only freshly brewed beans from the 24-hour barista – and doesn’t that make a 3am wake-up call seem slightly more bearable? The rooms are set up into different classes, but to be honest, each are of a pretty epic standard. Each bathroom has coloured tiles – which may sound odd, but I can assure you is incredibly chic – and a comfortable bed I’m told is made with topper, on top of topper, on top of topper. In addition to that, each room is fitted with a smart LED TV, Netflix pre-loaded (just sign in with your account details and they’re wiped as soon as the television turns off) and T2 bedtime tea. Actual bliss after being on a plane for hours. The first class suites also feature a monster-sized television that can swing to face the lounge or the bed, a beautiful bathtub and a very generous floorplan. A unique – and pretty incredible – feature of the hotel is its ‘meetings in the sky’. Through Felix, teams who are staying at the hotel and wish to organise a team-building catch-up, or an interesting change of pace for a meeting, can opt to take their team to the skies, aboard a private jet that will circle Sydney while you discuss business above the clouds. We’re serious – we know this because we did it. BYO oversized sunnies.